Hello all. I have been looking all over for certificates to use for our regatta. I would like to give them to the boys for best paint, best design and so forth. any help would greatly appreciated. BaltimoreRob wrote: Hello all. 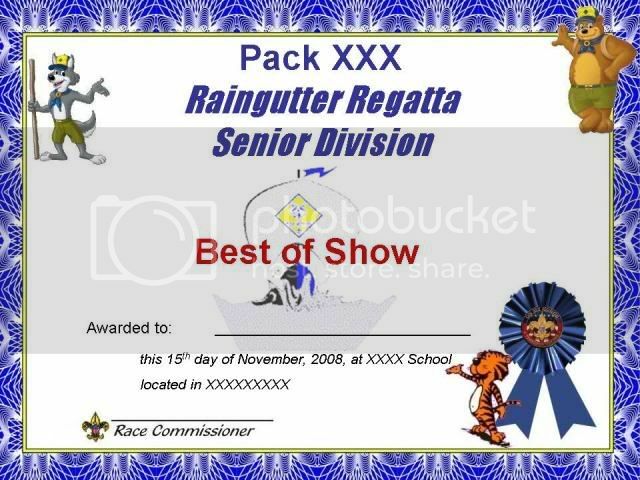 I have been looking all over for certificates to use for our regatta. I would like to give them to the boys for best paint, best design and so forth. any help would greatly appreciated. It's a powerpoint slide so you can change it say whatever award you want. We actually print these out as "Skipper Certificates" for each of the kids. It's put together from clipart from multiple places on the net! If this would help, send me a PM and I'll e-mail you a copy of the file. This is what we have used it is an Adobe Acrobat file, with Adobe Reader you can change the Pack #, date, and award type on it, but with reader you can only print, you cannot save changes to the file. PM me if you are interested and I can send you the file. Last edited by ah8tk on Fri Mar 11, 2016 9:26 pm, edited 1 time in total. You can PM me your e-mail address and I can e-mail you the PDF version, if that is the version you are looking for. Or you can PM 3 Cub Dad your e-mail address and he can send you the PowerPoint version. I've been off the boards for a while due to a major family move and job change. If anyone's looking for the powerpoint slide, just let me know.